Great product and great material it seems like they will last a long time. I was very pleased with these. They are very absorbent but what I like the most is they don't look awful after a kid has urinated on it because of the color. When I put the pads down and they use it once it looks gross. Very satisfied.... More.. The mattress cover works very well. Keeps the mattress Oder free, clean and dry. Soft material. Will be ordering more in the future when needed.... More.. Saved us a couple of accidents with our baby on our new mattress. Soft, breathable, Oder free and fully waterproof. Great product.... More.. This mattress sheet protector is amazing! My two year old is "potty train" but lets face it accidents will happen and especially at night, so I bought the sheet just the occasion and it’s been a mattress life saver. I can't believe how well it’s been holding, there was one night I thought for sure her mattress was going to be wet but nope the s... More..
Works great for my little one! Love this bed protector for my child's bed who is a deep sleeper. Does not leak and washes easily.... More..
Worth the money and made well. This work great! I purchased two so I would always have a clean one when needed. I've washed it numerous times and it's good as new.... More.. It had been great. My daughter’s bed is no longer suffering from bad smells. The absorbency of the mattress protector is just as advertised.... More.. It has a soft top and a heavier duty backing that holds up better to repeated laundering. It is especially great for those that tend to move around in the night, as the pads stay in place much better than disposable pads do. Would highly recommend to others.... More.. Excellent product washed up great and keeps spills and accidents off the bed.... More.. Very nice product. I bought 2 of these for a toddler trying to be a "big boy" and wear underwear instead of diapers at night. Easy to wash and dry. They saved the mattress!... More.. If you are looking for a product like this, go no further. This is a quality item and definitely worth the valued price. I would absolutely buy this item again.... More.. Excellent liquid proof pad. I use this for my small one year old baby when she is sleeping or sitting on sofa.... More.. The liquid stays on top so I could sop it up before tossing the pad into the wash. It saves my expensive sofa, carpet and bed from foul smell too.... More..
My son wets to many times that I decided to get this one. It can really hold his full bladder every night.... More.. Eliminate unpleasant and unsightly urine odors on the mattress and waterproof mattress pad with the revolutionary Silver Touch odor control waterproof mattress pad. 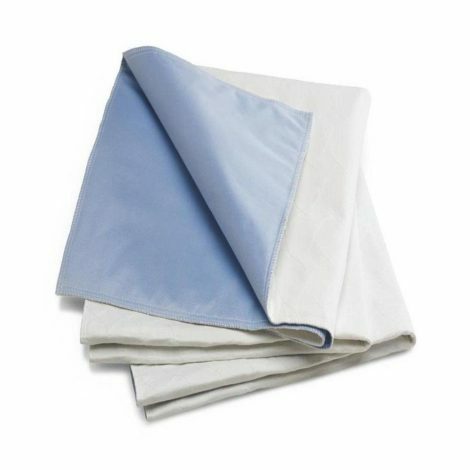 These washable bed pads keep your bed and mattress dry, clean and free from urine odors. Ideal to save your mattress and bed from nighttime bedwetting accidents, sweating, heavy perspiration and accidental liquid spills. Formulated with a special EPA registered antimicrobial solution called Silver Care, the Silver Touch odor control waterproof mattress pad kill odor causing bacteria so your bed smell fresh and new. The Silver Care solution these in odor control mattress pads acts as a preservative by protecting the waterproof bedding from staining and deterioration by mold, mildew and bacteria. Silver Touch odor control mattress pads inhibit the growth of odor causing bacteria on the bedding using proprietary Silver Care technology. Sliver Touch odor control mattress pads are machine washable and dryer friendly. The Silver Care technology does not wash out and remains effective through the life of the washable bed pad. Sliver Touch odor control protective waterproof beddings are easy to maintain. They can be washed in warm water and dried on low heat setting. Silver Touch odor control waterproof mattress pads are the right choice for those with little one’s around and bedwetting children and adults. This waterproof mattress pads uses EPA registered antimicrobial solution called Silver Care that kills the odor causing bacteria for the life of the waterproof mattress pad and protects it from staining and deterioration by molds. This washable bed pad is an ideal choice for many families and ensures that you enjoy a natural and comfortable sleep with fresh air smell. Silver Touch odor control waterproof mattress pads is a perfect solution to protect your bed from nighttime accidents and unwanted urine odor. Great product and great material it seems like they will last a long time. I was very pleased with these. They are very absorbent but what I like the most is they don’t look awful after a kid has urinated on it because of the color. When I put the pads down and they use it once it looks gross. Very satisfied. The mattress cover works very well. Keeps the mattress Oder free, clean and dry. Soft material. Will be ordering more in the future when needed. Saved us a couple of accidents with our baby on our new mattress. Soft, breathable, Oder free and fully waterproof. Great product. This mattress sheet protector is amazing! My two year old is “potty train” but lets face it accidents will happen and especially at night, so I bought the sheet just the occasion and it’s been a mattress life saver. I can’t believe how well it’s been holding, there was one night I thought for sure her mattress was going to be wet but nope the sheet did its job and now I am off to buy another one. Love this bed protector for my child’s bed who is a deep sleeper. Does not leak and washes easily. This work great! I purchased two so I would always have a clean one when needed. I’ve washed it numerous times and it’s good as new. It had been great. My daughter’s bed is no longer suffering from bad smells. The absorbency of the mattress protector is just as advertised. It has a soft top and a heavier duty backing that holds up better to repeated laundering. It is especially great for those that tend to move around in the night, as the pads stay in place much better than disposable pads do. Would highly recommend to others. Excellent product washed up great and keeps spills and accidents off the bed. Very nice product. I bought 2 of these for a toddler trying to be a “big boy” and wear underwear instead of diapers at night. Easy to wash and dry. They saved the mattress!